Kesar is one of the sweetest varieties of the mangoes, it is called the “Queen of Mangoes” by some. 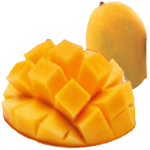 This mango is generally grown in the Gujarat and Maharashtra regions of India. Kesar is a larger variety which is hardy and resistant to the vagaries of travel. Tell a Kesar lover that the world will end tomorrow- that is okay. Declare that Kesar will end tomorrow and see the mad rush to stack up! It exhibits none of the temperament and sensitivity of the Alphonso, but is oozing with sweetness and fragrance. Its peak season is from mid-May to end-June.